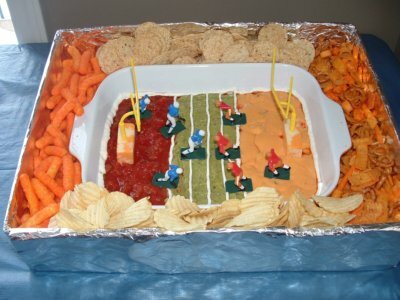 If you’re planning a Super Bowl or Football party, you’ll win the crowd over with this Football Party Dip! 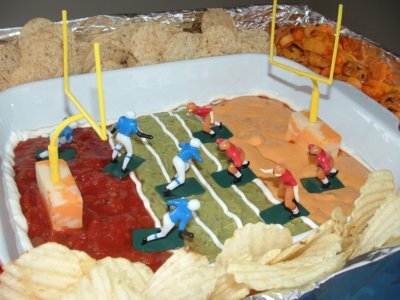 This football field chip dip is a fun way to tie in your football theme, and it’s easy to make! To make your “Stadium” start by taking a box that’s larger than your dip tray and cut the box so that it is about 2 inches higher than the tray with at least 2 or 3 inches of room around it. The purpose of the cardboard box is to make it somewhat portable and to create the Stadium effect. 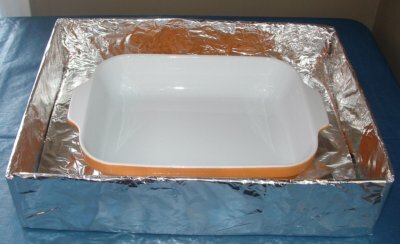 (If you don’t have a box, you can still make the football field and use a bowl for your chips) Then line the box with tin foil and use tape to hold it in place. If your using the football cake toppers, use a small block of cheese to hold up the uprights in the end zones. Use the guacamole in the middle to look like the grass. 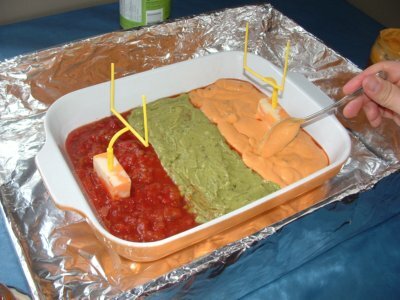 Use the salsa and cheese dip in the end zones to represent the team colors. Using an icing bag filled with sour cream and a Wilton tip #5, make the lines and outline of the field. Then place the remainder of the football players on the field. Now place your chips and nachos around your tray. Try and use a few different colors of snacks to liven up your crowd or show your team colors. Your Super Bowl Party Dip is now ready for the game, and will be a winner for all who enjoy!